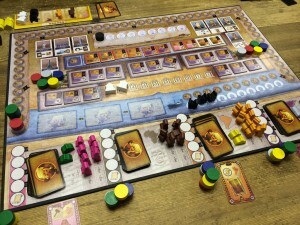 Artifact is a worker placement game with a difference as players place a common set of action markers which are limited in number and the cost of using them varies. Players are archaeologists digging up artifacts, shipping them home and putting on exhibitions (after all, as Indy taught us, ‘they belong in a museum’). Players primarily score victory points (VPs) at game end by gaining museum exhibition tiles and having cash. The final round is triggered by one of 4 different events such as finishing the 8th round, when one deck of artifact cards runs out, etc.